This past weekend I jumped aboard my first San Diego pelagic trip. This trip was very much anticipated for 3 specific reasons. First, it was my first pelagic trip in nearly 2 years! My last one was a trip from Ventura, CA in October of 2013. This was my first trip of this year, and I did not take any pelagics during my petroleum-free, Biking for Birds bicycle Big Year in 2014. After such a long hiatus, I was very excited to get offshore this weekend. Second, I figured this late-summer trip would give me a very good shot at 2 new birds - Craveri's murrelet and Least storm-petrel - and an outside chance at rarities such as Red-billed tropicbird, Guadalupe murrelet, and Wedge-tailed shearwater. Third, Sonia (my girlfriend) decided to accompany me on this adventure; This would be her first pelagic trip ever! yield the elusive Storm-footed petrel. It was her first pelagic so we'll let it slide. 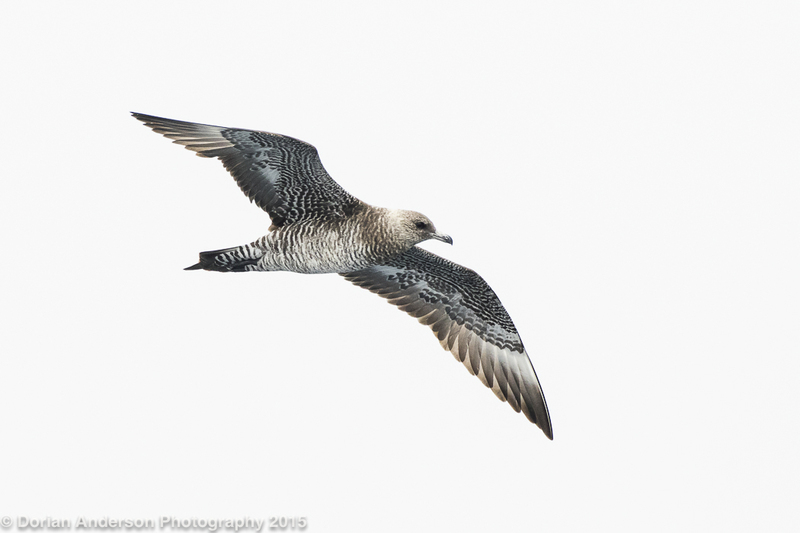 I was particularly excited for this pelagic trip given the building "El Nino" (Sorry, I haven't figured out how to add accents/tildes in Blogger yet!) in the Pacific this year. Very briefly, El Nino is an Eastern Pacific meteorological phenomenon whereby shifting equatorial winds deliver, through an interrelated series of events, warmer than usual waters to more northern latitudes including Western Mexico and California. This year's El Nino is actually shaping up to be as strong as that of the winter of 1997-1998. In addition to amazing fall pelagic birding, the 1997-1998 episode brought abnormally heavy rains during the subsequent winter. I was a freshman a Stanford at that time, and I recall a series of storms that flooded the entire campus. Classes were cancelled and students asked to report to the library to rescue thousands of soggy books (most of these were salvaged through chemical desiccation in the following months). Here is the Stanford paper from that memorable day. The reason all of this is relevant is that pelagic birding can really heat up as warmer water moves north. 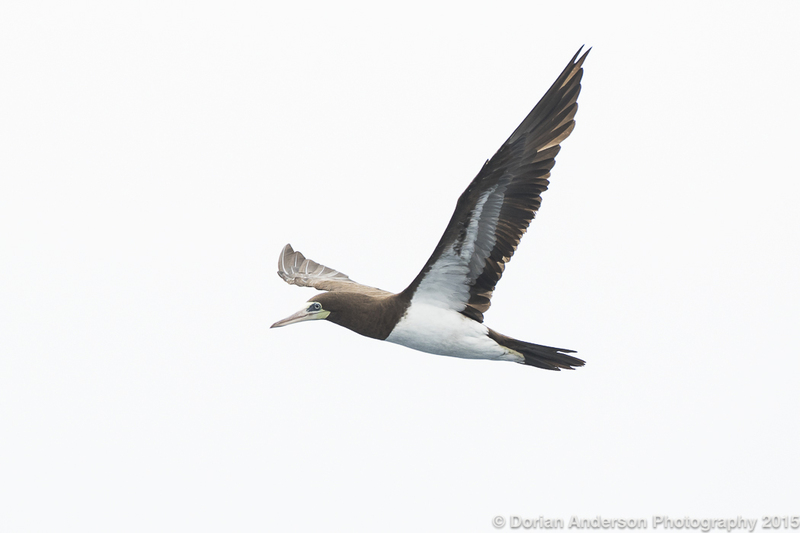 Birders never know what might show up on a pelagic, and this year's water conditions only added to the potential excitement. 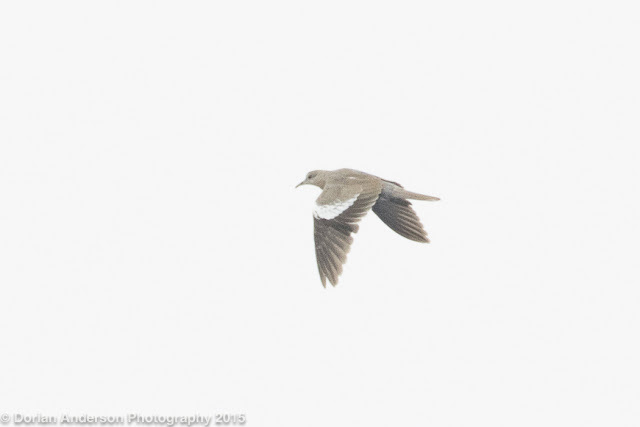 Both Least storm-petrels and Craveri's murrelets had recently been seen in the vicinity of the 9-mile and 30-mile banks - the two areas we would specifically be birding - so I was particularly hopeful that we would be able to find those would-be lifers. Without going through a minute-by-minute account of the trip, I will simply say that the trip was a lot of fun. The birding was what I would describe as slightly north of average - no better but certainly no worse. We had the expected shearwaters (Black-vented, Pink-footed, Sooty), Pomarine jaegers, and Black, Ashy and Leach's storm-petrels, but we "dipped" (missed) on the species that I was specifically seeking. We never found any big storm-petrel rafts, and Craveri's murrelet proved elusive despite calm conditions. Highlights did include two handfuls of Sabine's gulls, upwards of 20 Brown boobies, nice views of Cassin's auklets, a lone Black-footed albatross, an several sharks (Mako, Hammerhead). My personal highlight was the large (~400) pod of dolphins that surrounded our boat in the late afternoon. Many of them performed acrobatic leaps that propelled them 10-12 feet clear of the water's surface! After seeing them in the wild, one realizes what a tragedy it is to keep them in captivity. Notably, we saw very few whales, the lone exception being a fin whale that made a very brief appearance on our way in. I cannot help but think the lower than expected bird numbers and the low number of whales might be connected to what the fish (i.e. food) was doing on that day. Despite its seeming homogeneity, the ocean is an incredibly dynamic system. Once day can be quiet and the next in the same area can be non-stop action. That's why you have to take a lot of pelagics in order to be guaranteed to get a really good one! The overcast light and flight light made for comfortable birding and generally good viewing conditions. It also, however, rendered any photography the might occur decidedly unexciting. As a result, my camera stayed holstered for much of the trip. Here are the two best of the admittedly marginal few that I did collect. Every background was overexposed to get any detail on the birds. 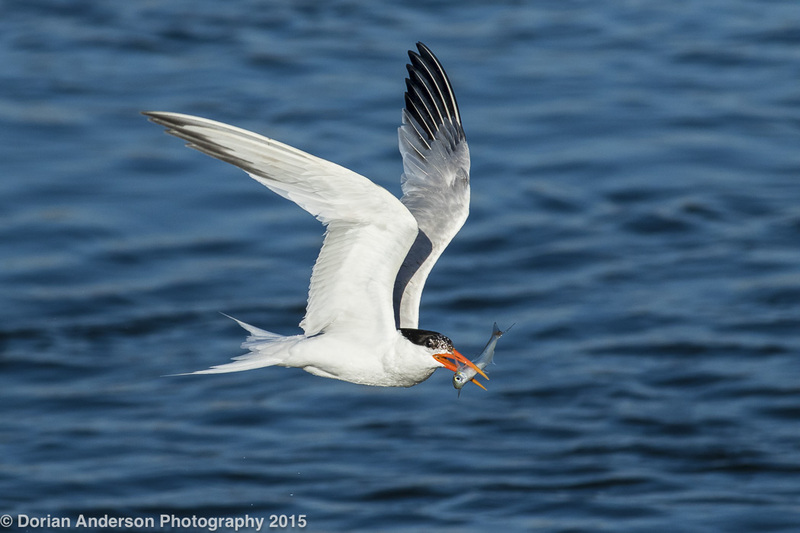 and are now allbut expected on San Diego pelagic trips. Interestingly, we had a number of offshore land bird sightings today. These included 2 female Brown-headed cowbirds, 2 Mourning doves, a hummingbird, several Barn swallows, and, most notably, 2 White-winged doves. I would like to thank the folks the trip organizers - Dave Povey in particular - and Pacific Nature Tours for what was a very enjoyable trip. Sonia had a great time and has expressed a desire to do more trips in the future, so we will certainly be taking many more trips while we are here in Southern California. I will be certain to post on those when they happen. 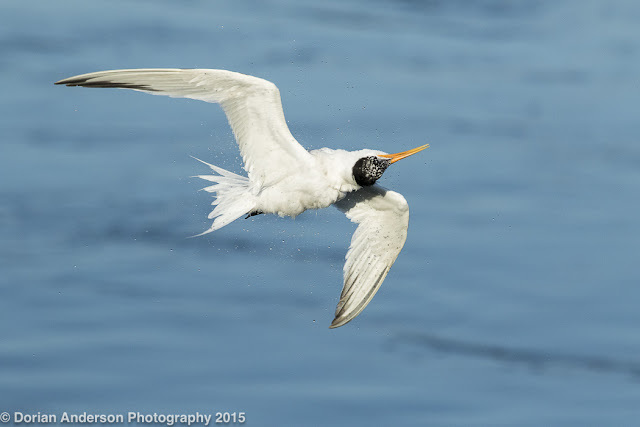 My next pelagics will be September 25, 26, and 27 from Monterey. In the interim, I will be heading to Sweden and Denmark to give a series of lectures about my biking adventure last year! I'm really Looking forward to some European birding in the next few weeks! Lastly, here are a few photos while futzing around Mission Bay and the San Diego River on Saturday evening. I had hoped for direct sun, but met with still-useable muted light late in the day. 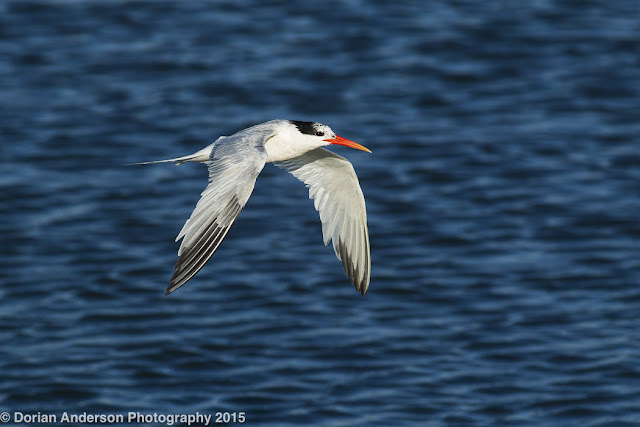 Post #33 - Elegant tern showcase! It has taken me a bit of time to get into a birding routine here in Los Angeles. I finally feel as though I have done this, so I hope that content will be a bit more forthcoming in upcoming weeks and months. This weekend, I had not one but two very productive trips to Bolsa Chica Ecological Reserve in Huntington Beach. My visits this weekend were squarely focused on photographing Elegant terns. This species seems to have been expanding northward fro Mexico in recent years; Thousands of the birds have nested at Bolsa in recent years. Most of them have cleared out with fall fast approaching, but there are still a healthy number of them floating around. I spent the entirety of both visits watching them fish at a particular corner of one of the impoundments. The tide was coming in, and with it came loads of fish. 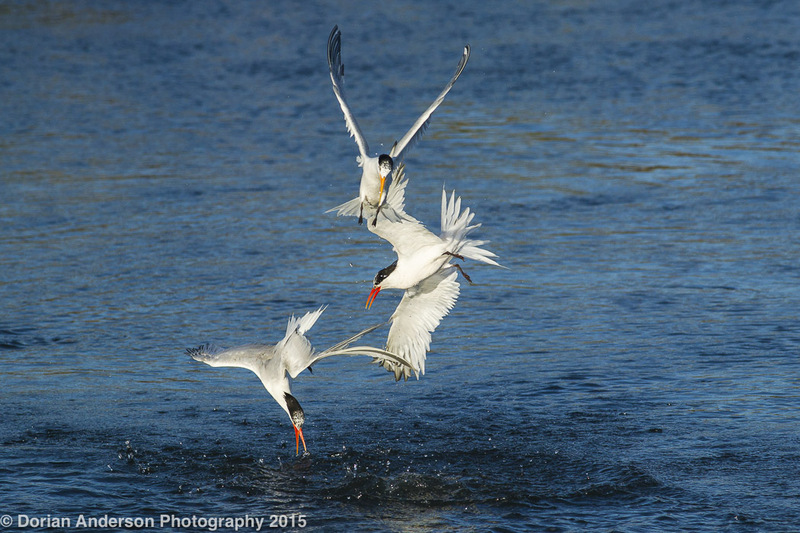 The birds were actively, and I set up photographic shop to document as much of the spectacle as I could. I think the pictures will give you a good idea of what I witnessed. The birds would fly around, looking for fish below them. 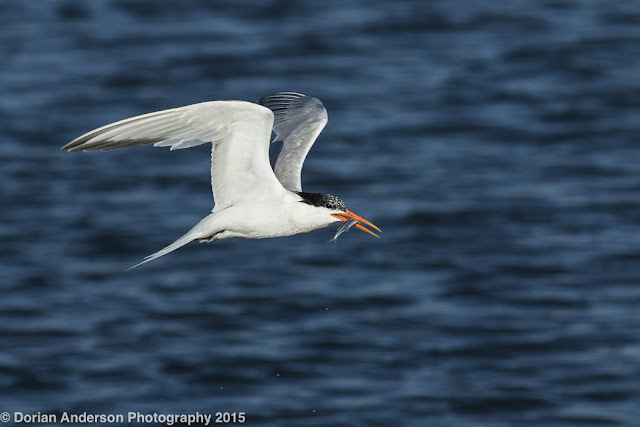 When a fish was spotted birds would dive at breakneck speed into the water in pursuit of them. This is a shot of several birds all going after fish at the same time. If unsuccessful, the birds would, in mid-air, shake themselves off and repeat the process. Those that were successful had sushi to-go! 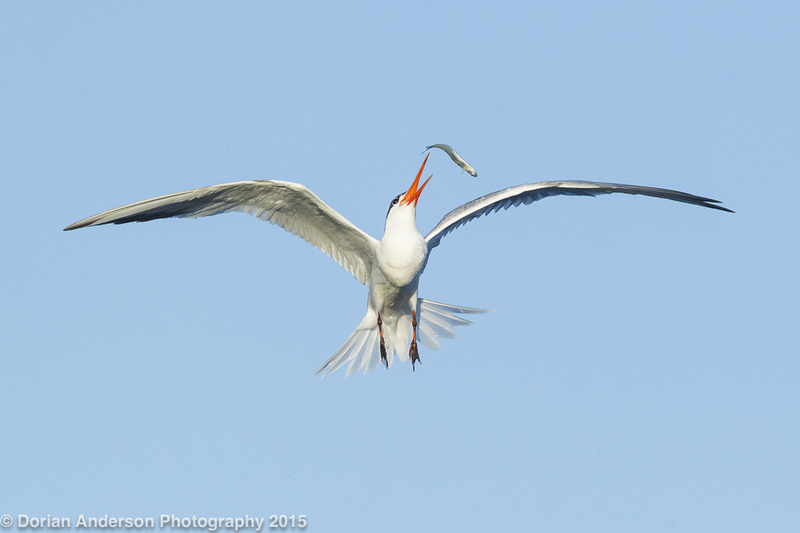 Sometimes, there is the need to reposition the fish after its caught. The tern will flip the fish up in the air and then catch it again, presumable with a better grip on it. Here's a shot of exactly this happening. Anyway, I hope this series show you at least a bit of the amazing action I saw this weekend! 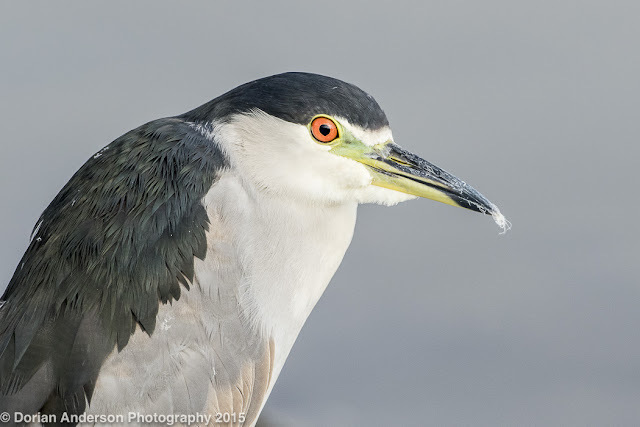 Post #32 - A bit of Biology - What is a nictitating membrane? One of this things that I love about photography is the ability to revisit the birds I saw in the field once I return home. The shot preserves the moment that I experienced and sometimes even augments it. Take for example this shot of a Red-winged blackbird that I took at Great Meadows National Wildlife Refuge in Concord Masssachusetts. 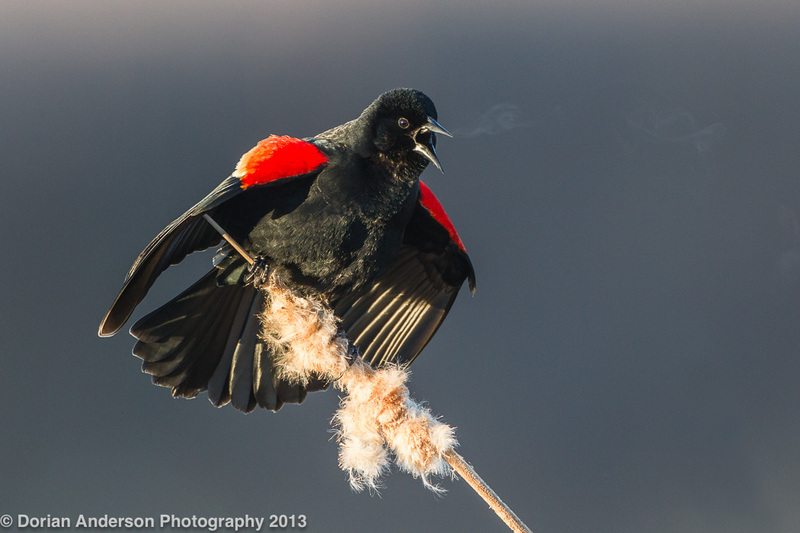 This was a very cold spring morning, so cold that I managed to capture his breath as he belted out his song. I did not notice this artifact in the field; It was only once I got home and started going through my shots that I realized what a unique capture this proved to be. I also realized how lucky I was to have this otherwise odd and admittedly cold-toned background against which the condensed vapor could be visualized. 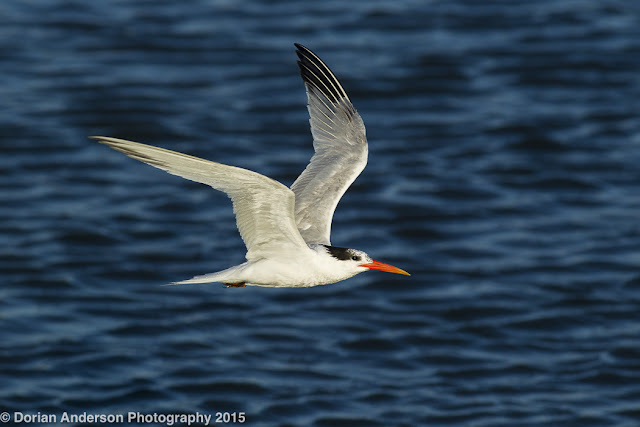 A similar phenomenon happened last weekend at Bolsa Chica Ecological Reserve in Orange County. Though cloudy for most of of the morning, the sun poked out just long enough for to shoot this cooperative Black-crowned night-heron. He was standing on a pipe, so I decided to crop it as a headshot to keep the man-made (and hideous) pipe out of the frame. At one point stretched his neck out and opened his beak. Always one trying to capture action, I was very happy he had given me at least this minimal amount of behavior. When I returned home, I realized that these two shots provided a perfect illustration of the nictitating membrane that protects the eye. 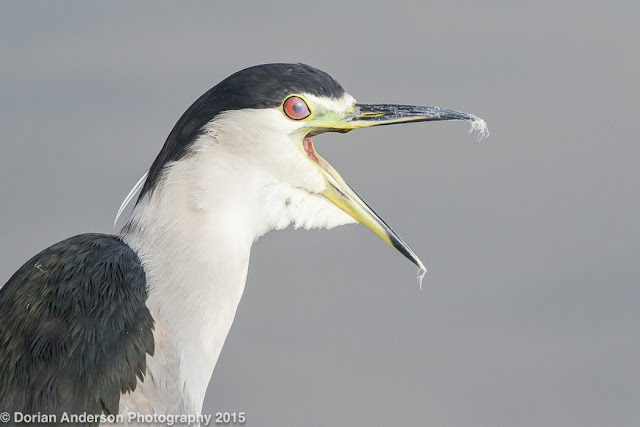 It's easy to see the membrane drawn across the eye in the second shot of the bird (below). Sun was a bit brighter than in above shot; Shutter dropped to 1/2000 from 1/1600 to keep whites. In fact, I had no idea that this membrane was called. I actually had to look it up for myself. Beyond the proper name for the structure, I learned that birds are not the only creatures that possesses nictitating membranes. Fish (including sharks), amphibians, reptiles, and some mammals - notably Polar bears, Beavers, Manatees, and Camels - have them as well. In contrast to an eyelid which closes the eye in the vertical direction, the nictitating membrane is drawn across the eye from front to back. The membrane is translucent, providing protection while still permitting some form of visibility. I guess it makes sense that an independent mechanism has evolved to protect the eye while still allowing at least enough vision to, say, escape an unexpected attack from a predator. I am not sure why the bird above drew the membrane across its eye at the time of the shot. Given that he was effectively stretching, it is totally possible he was just going through a routine "system check". Anyway, hopefully this proves at last minimally informative for some of you! Post #31 - A potential North American first - GRAY THRASHER!! Well, I might have ticked my first life bird of 2015 this weekend! 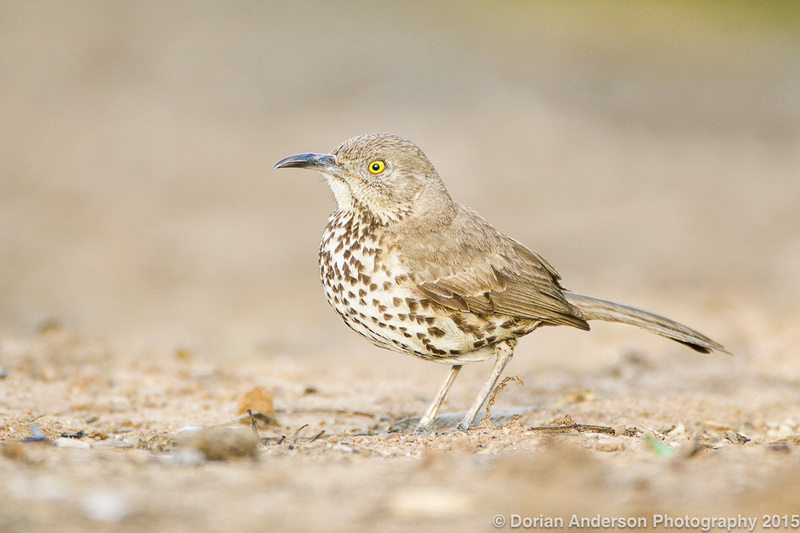 I say might, because, as I'll discuss, there is at least some amount of uncertainty about the origin of the Gray thrasher that appeared in San Diego this weekend. As I was readying myself for a Sunday afternoon of general, Orange County birding, I received a phone call from a friend informing me that a Gray thrasher had been found at Famosa Slough in downtown San Diego. 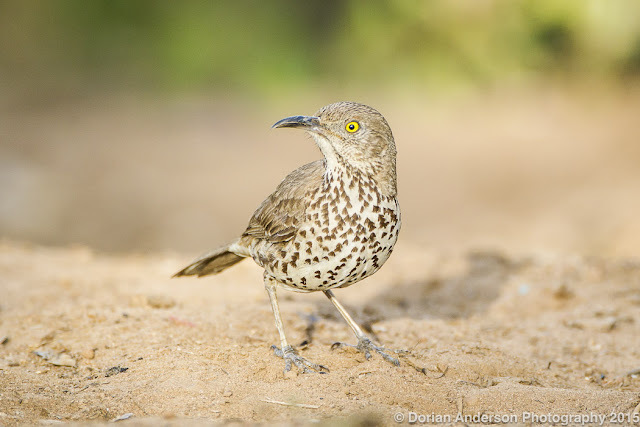 I will admit that Gray thrasher was not on my radar at that precise moment, but a quick internet search revealed that this otherwise Mexican endemic is confined exclusively to the Baja Peninsula. 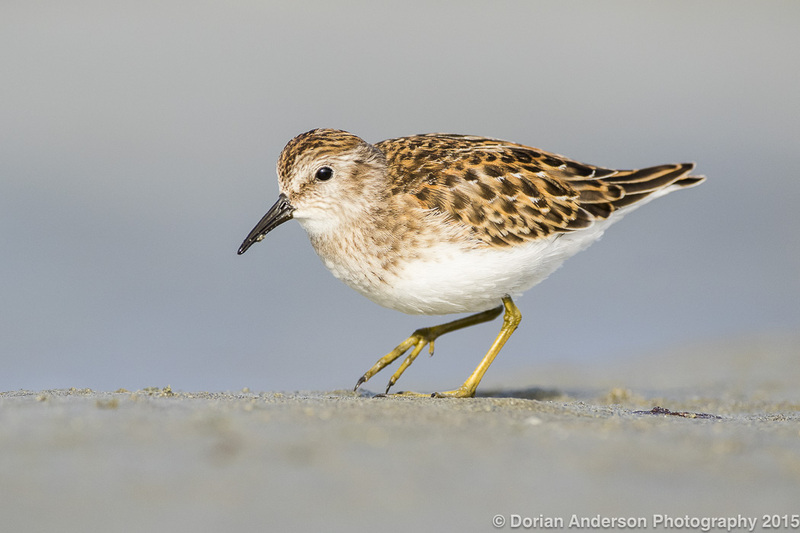 Despite the fact that this species usually ranges to within ~150 miles of the US-Mexico border, it had never been recorded in the United States before Sunday. I decided this mega-rarity would my first dedicated California bird chase since moving here 4 months ago. It certainly felt weird chasing a bird down I-5 in a car. Last year I rode my bike along this exact route as I chased a Yellow-green vireo on Point Loma. That bird required 90 miles of riding to tick. I was the last person to see that particular bird! This species is non-migratory and generally sticks to specific types of habitat on the Baja Peninsula. On one hand it is a bit surprising that this bird made it to San Diego. On the other, its such a short distance that it is totally plausible from a physiological standpoint; It's not as though this land bird was forced to cross an ocean, for example. Anyway, debate has already started as to whether this is a truly wild individual. For those unfamiliar with this consideration, if this bird was known to be an escaped, once-caged bird it would not be countable. The problem is that we will NEVER know for sure which is why a debate will occur. There California Rare Bird Records Committee will certainly have its hands full with this deliberation. My sighting of Red-legged honeycreeper from Texas last year is also under review, so I could end up with 0, 1, or 2 still-provisional birds added to my North American life list (which now stands at 696). 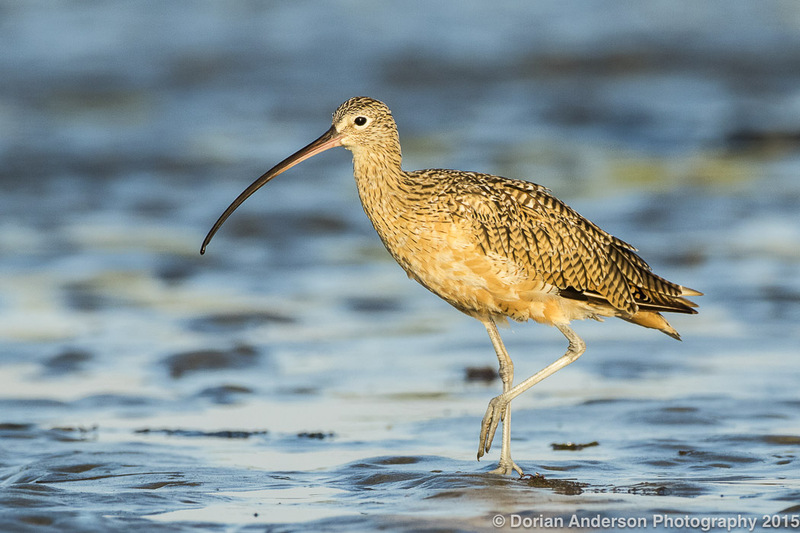 There are many points that have been brought up for and against this being a wild bird. 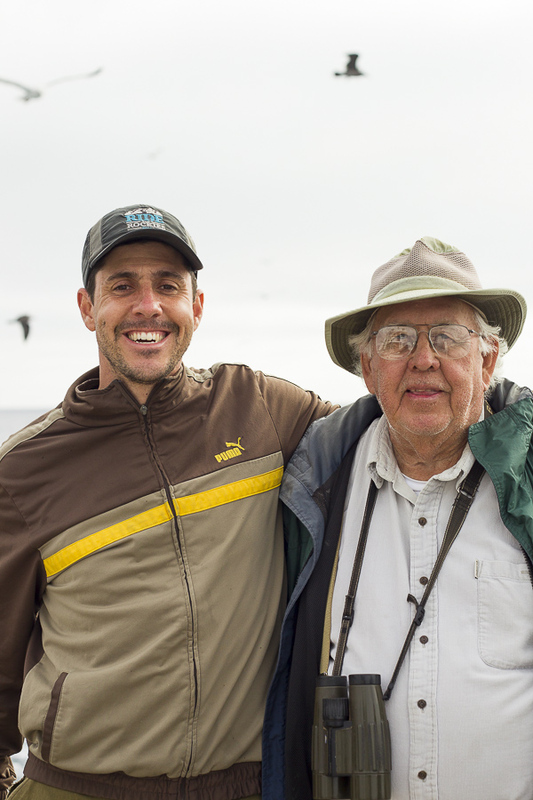 For those that want to read the finer point of the discussion, I will point folks towards the ABA San Diego bird list for a full conversation. 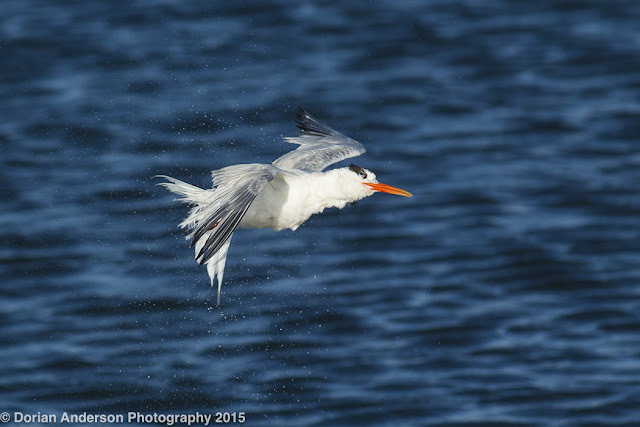 Gary Nunn's SD birding blog is also worth a visit for information on the bird and more general information on birding in the area. Anyway, here are a few of the points that have been brought up. - This species, like many other non-migratory birds (Nuttall's woodpecker, California towhee, e.g.) generally doesn't wander from its range. But hey's, there's a first time for everything, right? - There has been some wetter weather around here this year. The Angels were rained out at home for the first time in 20 years two weeks ago), so maybe the still-building El Nino helped move the bird north. After all, it's only 150 miles, nothing by vagrant standards. - This species, like seemingly every other species that occurs there, has been observed caged in Mexican towns by visiting birders. So, there is a precedent for caged thrashers. What this says about this bird is left to be determined. - Feather wear seems within the acceptable range. A recently caged thrasher might be expected to have more wear on its tail fathers from clanking around the cage. This is a ground dwelling species so some amount of tail wear is normal. - The bird had a spot of something on its uppertail. Some that this was bird poop that might have come from being caged with another bird. Alternatively, it is possible that a wild bird pooped onto this wild bids tail. Most observers seem to think that the spot was actually mud which would render the above "poop-gate" theories moot. - It foraged close to us, but did so in a completely wild-type manner. - The bird appears to be of the northern subspecies, the one we might expect to show up in SoCal. - The bird was missing a claw - who knows what the hell that means?!?!!? Anyway, you get the idea. No one consideration seemed to fully support or refute the "wildness" of the bird. The appointed folks will certainly have a lot to consider during their eventual deliberations. Who knows when that will even happen?!?! Regardless it was a nice afternoon out, and it permitted me to reconnect with a few people I met last year and introduce myself to a few new ones as well. As for the bird, whatever will be, will be, right?